The new summer RAILBRICKS issue is available for free via their web site! Check out reviews of all the new LEGO® City train sets, take a look back at Brickworld Chicago and much more. Be sure to read the behind the scenes interview with LEGO® Train designer Ricco Rejnholdt Krog and Henrik Andersen. And learn how to build a small diesel shunter model by Tille Muovinen with just 89 pieces. You will find it all in the latest issue of RAILBRICKS, go to railbricks.com for more. GFLTC returned to the 66th H&R Train Show in full force. 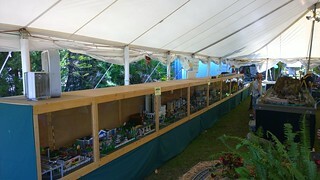 The roughly 3' x 55' display took up the entire back wall of the tent, and was the longest display the club has done using the old wooden cases. This is also the first show where all of the track inside the cases was ballasted and all battery-powered trains were used. 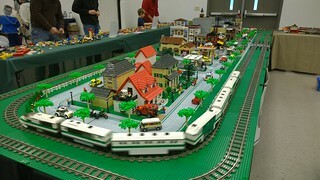 The Greater Florida LEGO Train Club returned to Hillsborough Community College's Plant City Campus for the 24th Annual Train Show put on by the H. B. Plant Railroad Historical Society. Brickfair Alabama was held in for the third year at the Birmingham Convention Center, but this time it was moved to the larger East Hall. This is the second time GFLUG has display at this event in Alabama. And the Birmingham convention center is well maintained facility and an excellent location for this event. Public attendance for this show seemed quite large, with the GFLUG layout having a crowd of two or three deep all the way around us all day Saturday. The Sunday crowd was not as big, but a sizeable crowd never the less. On the other hand, the attendance of MOCs toting AFoLs was less this year. I am guessing the winter season was ruff on many of the planned attendees, because there were many cancelations. 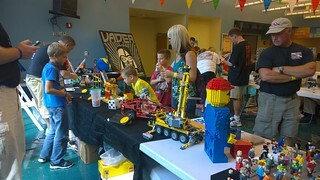 There were many bare areas on the tables and far less quality MOCs to see in the various themed areas this year. The organizers say they will work on getting more AFoLs with MOCs for next year's event. Matt S - The LEGO Movie is a film that will simultaneously appeals to LEGO fans of all ages and those who love them. As an AFoL (Adult Fan of LEGO) and the parent of two KFoLs (Kid Fan of LEGO), I was able to enjoy the movie as both a parent and a fan. The song in the movie "Everything is Awesome!" will quickly drive parents and AFoL to the brink of insanity! More ⇒ The Greater Florida LEGO® Users Group was formed in summer of 2000 for the sole purpose of giving Adult Fans of LEGO® a way to express their unique hobby. 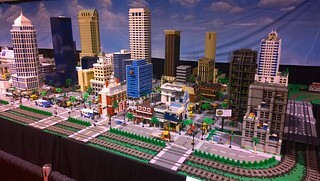 More ⇒ This is a club created website for fans and members of the Greater Florida LEGO® Users Group. LEGO® is a trademark of the LEGO® Company which does NOT sponsor, authorize or endorse this website. Copyright ©2000-2016 Greater Florida LEGO® Users Group - GFLUG. All rights reserved.